Say goodbye to that rat's nest of breadboard wires. 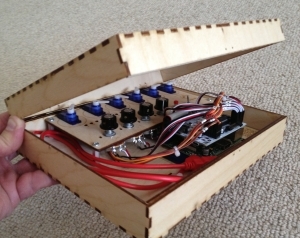 The BreadBox keeps your Arduino, Raspberry Pi experiments safe and solid. You can focus on your software, not on loose connections. You can even take your project to a local meet-up. The BreadBox is an experimenter's kit made to hold your gear together so you can travel with it. No more having to figure out what came loose - the stuff that drives software folks crazy. 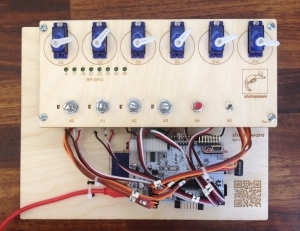 This kit is designed to help a software person - like me - play with the analog world. See a short video of the BreadBox in action! 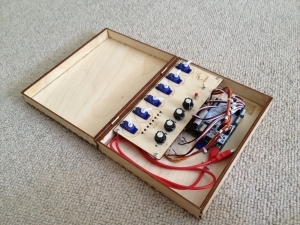 UPDATE: The kit is now available from Jameco Electronics and was featured in their newsletter! If you want a logo box to carry your kit, see below for details. Why? 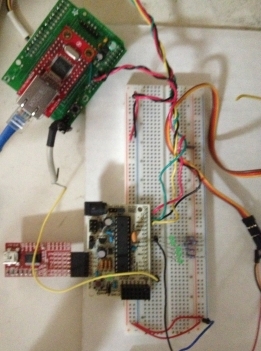 - I used to experiment with my Arduino using a typical bread board. Stick some wires into these holes, stick some other wires into those holes and viola, my experiment was under way. I'd write some software, put my setup on the shelf and go to bed. The next day I'd pull it down, run the software and something wouldn't work. Huh? Yep, one of those wires came loose. Find it, fix it, back in business... until I brushed the setup with my arm while reaching for a soda and something else came loose. What? Where? It drove me mad. And forget about taking my setup to a friend's house - no way it would travel. At one point I even pointed a web cam at my setup so I could show it to friends. It was all crazy. There had to be a better way for me, a software guy, to play with this new hardware. Out of my frustration the BreadBox was born. How? - Buy the BreadBox kit from Shrimpware LLC. The instructions are available on this web site and I think they're pretty good. You'll have to be able to do some rough soldering. I also provide some simple Arduino software you can use to get started. The software is not spectacular, just a place for you to start. When? - Now! Order yours today! Documentation - See the latest documentation for assembly instructions and base software. Projects - As I play with my own BreadBox I'll put projects on this web site with sample code to help you get started. PIR - Passive Infrared Motion Detector. A simple project to hook one up. 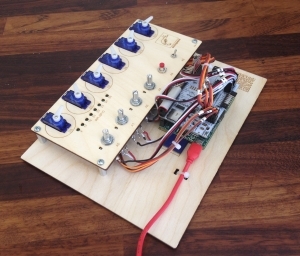 Five Button Joystick - An easy project to show the joystick controlling the servos. This shows the BreadBox kit. Easy to sit on a table and play with. I've outfitted it here with a Raspberry Pi and Alamode. Here's a picture of the assembled BreadBox in The Logo Box. Close the lid and it is all nice and neat to travel. See how that USB cable can just sit in there? This shows the BreadBox in The Logo Box with the top open. Nice! BreadBox inside and safe to go. I've use spray paint to customize some of my own Logo Boxes. 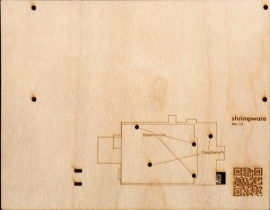 The kits are made of cabinet grade Baltic birch plywood and precision cut by laser. The process leaves some resinous residue on the wood. Most of the residue will come off with a light rub from a damp cloth. You can also lightly sand the pieces with 320 grit sandpaper, spray paint the pieces to customize your kit, or leave it as-is. I find that the bare wood with slight resin marks gives the whole thing a nice steam punk kind of feel. I'm a one man shop. I make the parts myself in California. I take payment only via PayPal. Prices below do not include sales tax or shipping. I ship USPS which usually costs $5 in the U.S. Most orders will ship in one week. I have three kits that all work together: the BreadBox, the GPIO LED board, The Logo Box. Feel free to check out the latest assembly instructions before you buy the kit from Jameco. If for some reason you need to buy just the mounting boards, you can buy a set from me. Please note that this mounting kit only includes the two parts pictured below. This kit makes it easy to see how the GPIO pins on a Raspberry Pi can control LEDs. The kit is designed to press fit into a row of holes in the BreadBox kit. This kit is only available from Jameco. I have the latest assembly instructions available here. See a video of the GPIO LED kit in action. The BreadBox can be used by itself, sitting on your desk. You can carry it around too. However, a box is nice to have. The BreadBox will fit in a box that has internal size of at least 9 5/8 x 7 1/2 x 2 1/2 (inches). You might find a cool old cigar box or jewelry box to put it in. You could even do some modification of the base to fit in a smaller box. If you want to build a box, then this Logo Box will work for you. 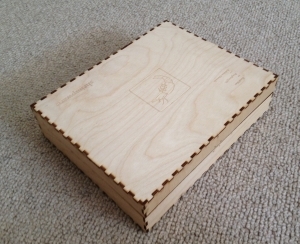 This is a set of precision laser cut wood pieces that you can glue together to make a logo box for your BreadBox. The kit contains two hinges and one clasp as well. The assembly instructions are straight forward, but you have to take some care when gluing the parts. It helps if you have little bar clamps. Please check out the assembly instructions for the Logo Box to make sure you are comfortable doing the work. I really enjoy learning new things and sharing them with others. I have a few pages on my web site with the things I've learned about the Raspberry Pi and Arduino, I hope these links help you out.